I'm not normally one for trousers, but when Zalando contacted me recently about featuring an item from their website on my blog, I decided to opt for something a little out of my comfort zone. Patterned cigarette pants are so hot this spring and I couldn't resist this blue and white floral pair. I'd recommend keeping the rest of the outfit fairly simply with such statement trousers, I opted for this textured white top (which I also bought in black!) and casual heels. These photos were taken in Holland Park which I probably rave about all the time on my blog. It is such a hidden treasure in the big city of London, full of beautiful houses, peaceful street and gorgeous scenery. I'd definitely recommend a visit! A fun little fact for you, when Josh and I were waiting for the lift at the tube station, out walked Rick Edwards! I've seen him before randomly in the street, but I thought it was pretty cool he was at the tube station. I'm pretty excited about uni this term, as we've got a group project to set up our own business. Things are slowly but surely coming together and I'll tell you a little more about it next time! Remember to like my new page on Facebook! And follow me on Twitter and Instagram too! These trousers are beautiful! 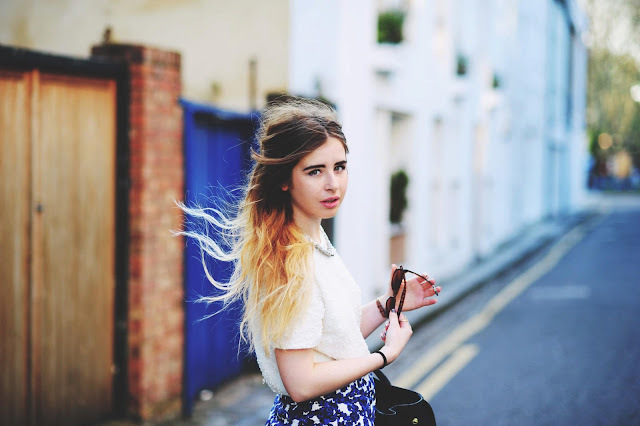 You are quickly becoming my favourite fashion blogger! No wonder you snapped up those trousers! Love them! I love those trousers! great pictures. that statement trousers is too cool! and i love the scenery on the holland park, wish i could go there. This outfit is perfect, I love the mix of the trousers with the pretty knit top! Love the top and we have the same sandals! I love your trousers just like everyone else I think they're gorgeous. You look fabulous. your blog is awesome, your photos are breathtaking, and your style is just stunning <3 love you!